Not from a Box: Puppy Bowl! The Super Bowl? What's that? Yesterday was all about Puppy Bowl. I'd been looking forward to it since I saw the commercials on Animal Planet around Christmas. As I've said elsewhere, how can you not love puppies running around a miniature football field, tumbling about, and just looking really cute? I had a whole afternoon planned, complete with snacks to accompany hours and hours of puppies. 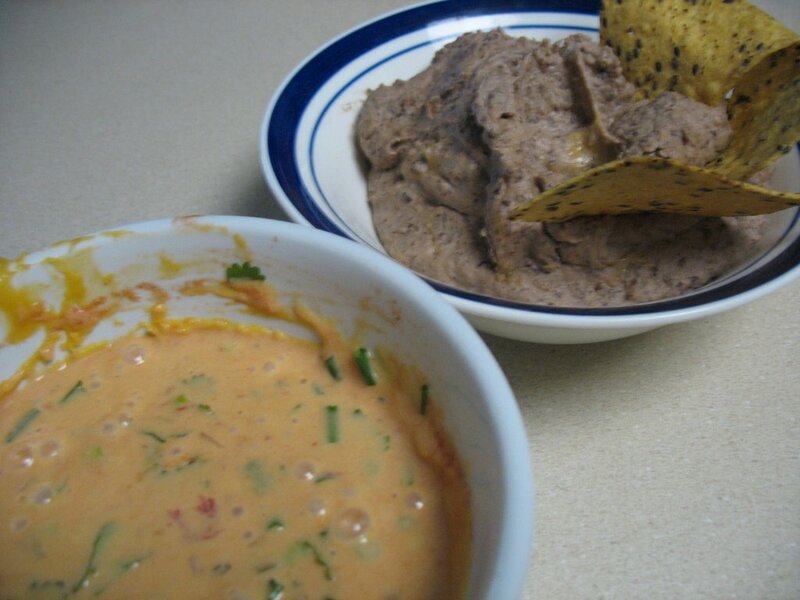 I made Glorified Frijoles, using a recipe I got from The San Francisco Chronicle a few years back, and a cheese dip made with Velveeta. Yes, I know. Processed cheese food is just about the exact opposite of whole food. But I have a slight obsession with gooey, neon orange, fake cheese, and I'd never cooked with a brick of Velveeta before so I was kind of excited about it. 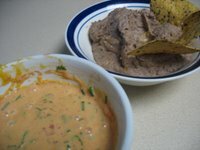 These were served with soy and flax seed tortilla chips, which I thought would make the whole thing slightly healthier. I end up making a ton, which I thought I would have to eat all by mself, until the Anthropologist returned from the Seabright Brewery, having not found a place to sit, with a friend in tow. So it was a good thing I'd made so much! In a small saucepan, saute the onion in olive oil until fragrant. Add garlic and cook for another minute. Add beans and heat through, then stir in cream cheese until combined. Add chile powder and cheese, and cook until "volcanic." Put cheese food, salsa, and sour cream into a microwave safe bowl, and microwave for about 3 minutes. When melted, stir in green onion and cilantro, mixing to a smooth consistency. I switched over to the Puppy Bowl, off and on duringthe game. It was fun! I love that recipe and am familiar with Jacqueline Higuera McMahan and have made several of hers that have been in the Chronicle. While I have many plans for many parties, I really want to have a Dips party, where everyone brings their favorite dip and dipping items. I haven't had velveta in ages, but I used to love those huge Costco cans of "Que Bueno!" nacho cheese. Sher - I'll have to look up more of her recipes, to be sure. Mike - I totally want to have a dips party (because of all the wonderful dips in a holiday appetizer magazine I picked up at Christmas)... but I've been too busy to have loads of company over. I watched part of the "Puppy Bowl" during Super Bowl commercials. Unfortunately, I missed the halftime, which I heard was a bunch of kittens. Shucks! Karen - Yes, the "kitty half-time show" is great. Although, since kittens are not always as active as puppies, there is a lot of "half-time" that involves the kitties sitting around or even sleeping!